Propelled by the success of two National Moot Court Competitions organised by the Moot Court Society of Amity Law School, we have now embraced to follow the league and host the 3rd Amity National Moot Court Competition. 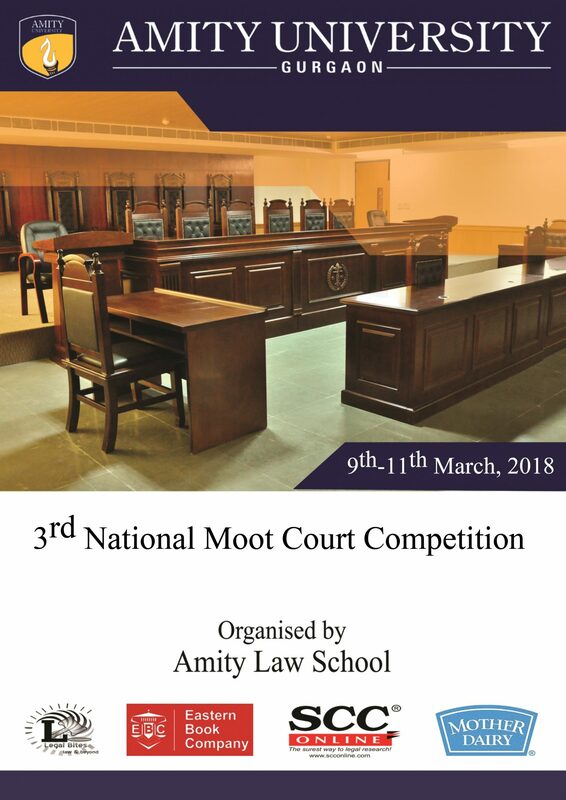 Sponsored by SCC Online, Amity Law School Gurgaon is organizing its 3rd Amity National Moot Court Competition 2018 from 9th March to 11th March, 2018. Students pursuing the three or five year courses of the LL.B. degree or its equivalent in the academic year 2017 – 2018 from Institutions all over India are eligible to participate. Any Institution shall be entitled to send only 1 (one) team to the Competition. The participating team shall comprise three members. In an exceptional case with the approval of Organizing Committee, a team may comprise of two members, and one of the Speaker will also be designated as Researcher. In a team of three members, two members shall be designated as Speakers and the third member of the team shall be designated as a Researcher. No additional member or team coach is allowed to accompany the team. The Institution should provisionally register themselves by sending an e-mail to alshmoot2016@gmail.com latest by January 10, 2018 (23:59 hours IST). and screenshot of the completed transaction; through e-mail to alshmoot2016@gmail.com, latest by January 20, 2017 (23:59 hours IST). Institutions shall send the hard copies of registration form along with their memorials, latest by 25th February 2018. The teams shall be required to pay the Registration Fee only after they have received confirmation mail by 11th January 2017. For Brochure and Moot Proposition, Click Here.